If you’ve ever been lucky enough to be captivated by the twinkling stars on a clear night in Haida Gwaii, you know it is one of the most beautiful sights in the world. Starry nights on The Clubhouse deck, flavourful food and wine, and meeting guests from around the world are experiences I relish whenever I get the chance to visit our flagship lodge. Lucky for me, my recent trip to our sold-out International Culinary Series – London event did not disappoint. A special star – a Michelin one to be exact – traveled from across the Atlantic to shine in Haida Gwaii. Executive Chef Gary Foulkes, of one of London’s most prestigious Michelin-starred restaurants, Angler, was our guest chef for the trip. 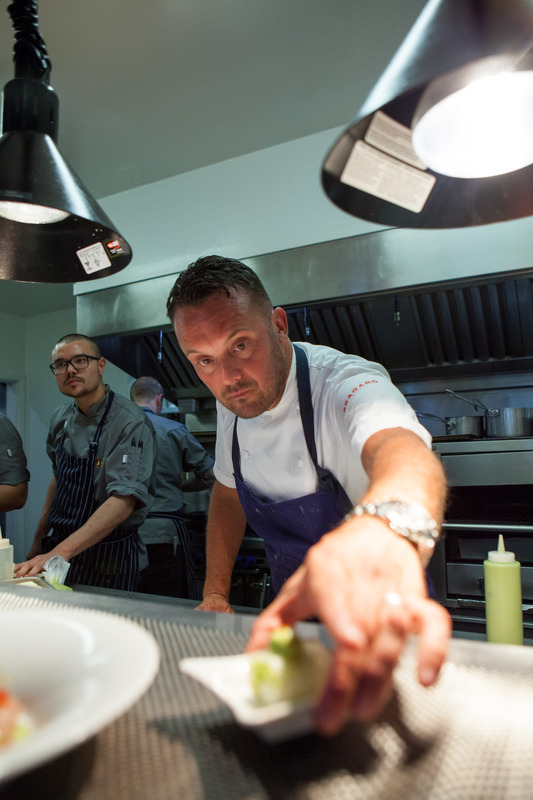 Foulkes is one of the UK’s most highly acclaimed chefs with more than 20 years of experience working in Michelin-starred restaurants. 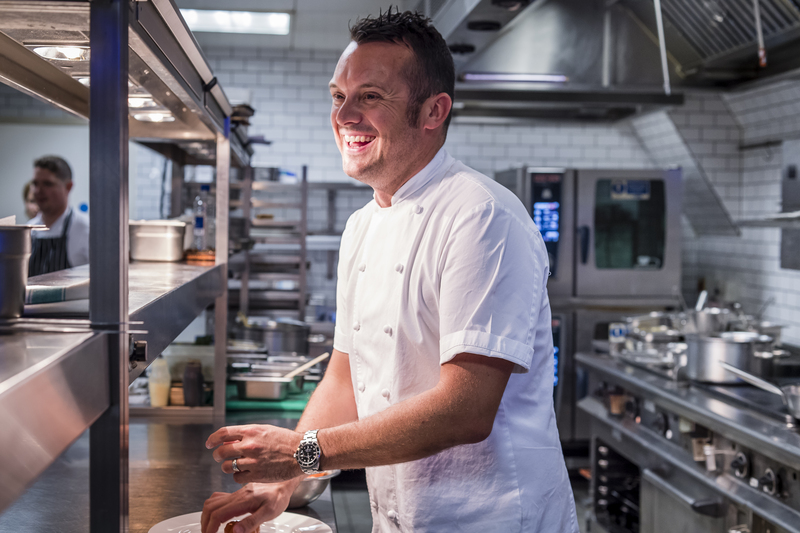 Guest chef Gary Foulkes from Angler restaurant located in London’s South Place hotel. So Why London? And Just What is a Michelin star? 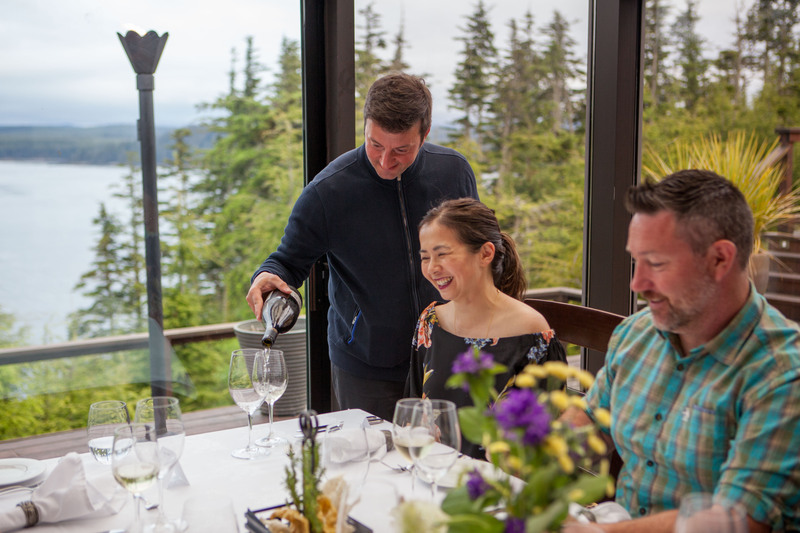 After learning more about Angler’s sensational picture-perfect plates and focus on sustainable seafood, I knew our guests were going to be royally spoiled by our English guest chef even before our helicopter touched down at The Clubhouse. 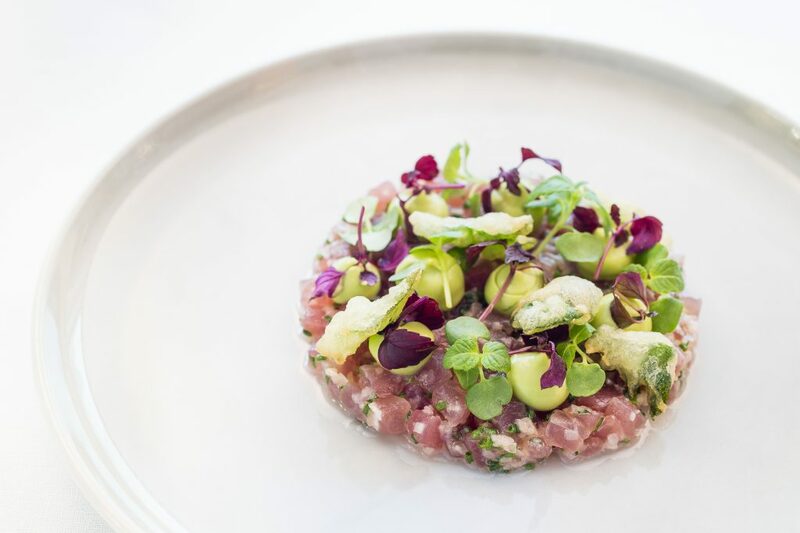 Foulkes’ tuna tartare, hass avocado, wasabi and shiso. The first two days of the trip, fishing was on the menu. Sunny skies on Sunday afternoon and winds on the west side made many of the boats head to Cohoe Point for calm waters. 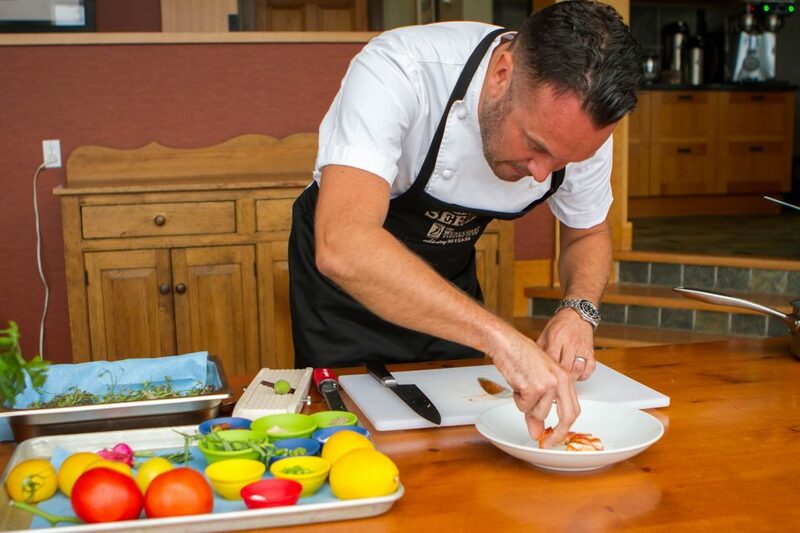 While guests fished on Monday, Foulkes spent the day in the kitchen preparing his four-course dinner with The Clubhouse’s kitchen team led by our Executive Chef Rob Ratcliffe. Our two English chefs, Foulkes and Ratcliffe prepping in The Clubhouse kitchen. A Michelin-star meal deserves deliciously-paired wines hand-picked by an expert sommelier. Fortunately for me and our lucky guests, Rocco D’Agostino was our guest sommelier from Mission Hill Winery and brought some of their finest wines to pair with Foulkes’ impressive menu. Our guest sommelier, Rocco D’Agostino pours Mission Hill’s Reserve Pinot Gris. Rays of sun cascade into the dining room highlighting our 4-course food and wine menu. Spot Prawns, chilled avocado cream, summer roll, green apricot with 2017 Mission Hill Reserve Pinot Gris. 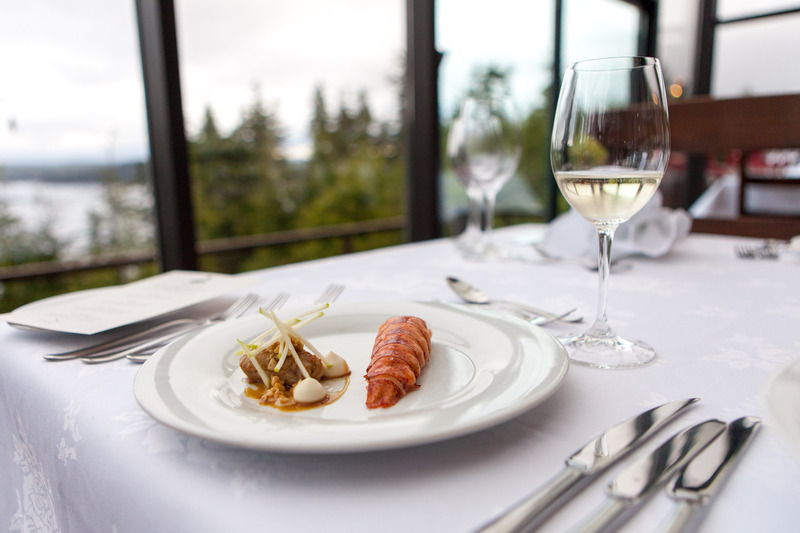 It was the chef’s first time working with B.C.’s infamous spot prawns which he compared to a langoustine. Local green apricots from Graham Island with their slightly bitter taste balanced the sweetness of the raw spot prawn. Chef Foulkes plating a summer roll that accompanies the spot prawn dish. D’Agostino told guests the secret to a great wine pairing is that it should entice guests to go back to eat more of the dish. 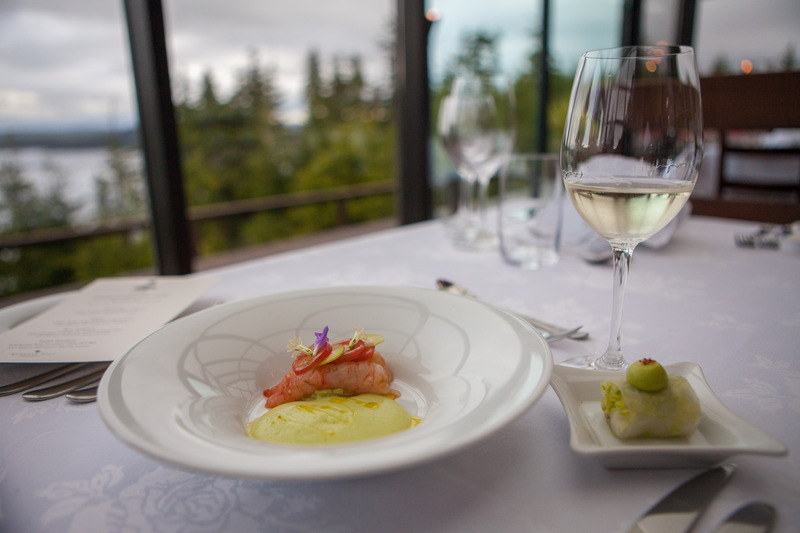 The Reserve Pinot Gris, using the top 15% of all their estate vineyards, paired nicely with the spot prawn matching the texture and fresh acidity. Lobster, Stuffed chicken wing, hazelnuts, roasting juices with 2015 Mission Hill Family Estate Perpetua. Chef Foulkes’ take on our North American ‘surf and turf’ dish was my favourite. The lobster was served with a classic sauce of roasting juices and paired with a tender stuffed chicken wing. The boneless chicken wing was stuffed with mousse made of chicken breast and egg. Apparently, stuffed chicken wings are a ton of work – so, sorry my friends, he won’t be cooking you up an extra side order the next time you are in London. Mission Hill’s Perpetua is from their luxurious Legacy Collection and is 100% chardonnay. The wine nicely complimented the texture of the lobster and richness of the roasting juices. Bison Tenderloin, White asparagus, local morels, oxtail bordelaise sauce with 2013 Mission Hill Family Estate Quatrain. The bison was mouthwateringly tender, slow roasted for about 18 minutes. Bordelaise sauce is a classic French sauce named after the famous Bordeaux wine region in France. 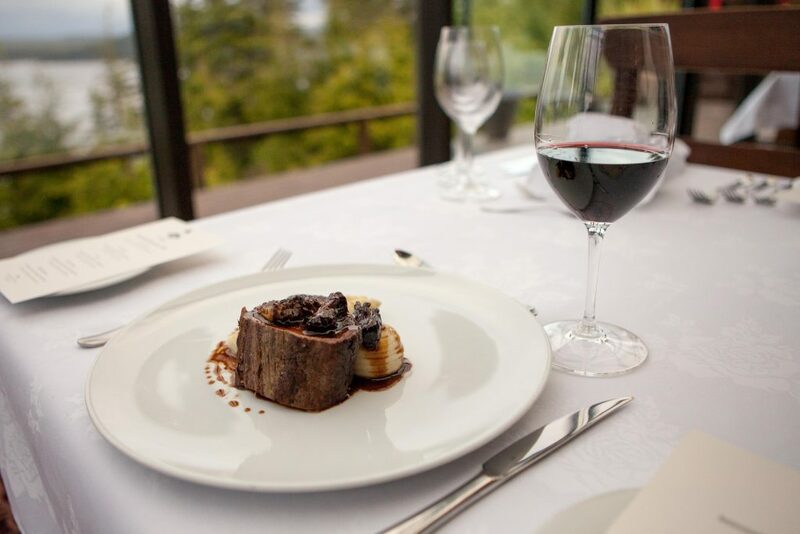 Rich and flavourful, the savory red-wine sauce paired with local morels complimented the tenderness of the bison. 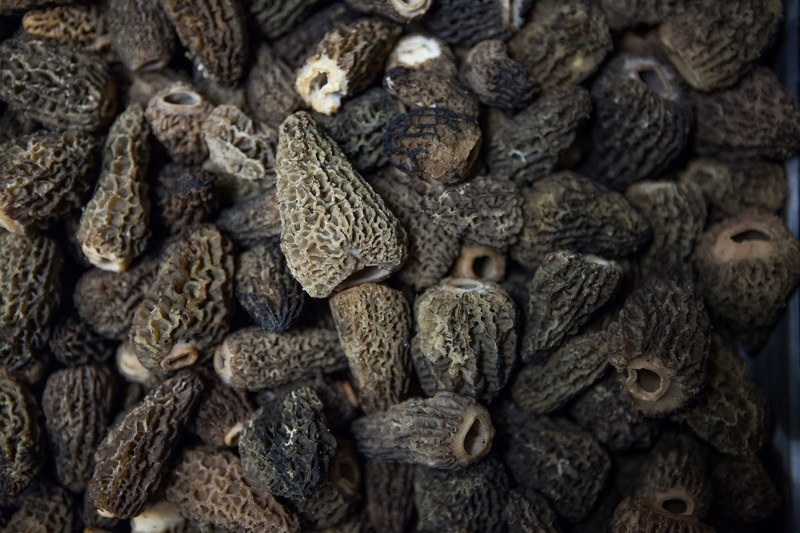 Rare morel mushrooms are known for their meaty texture and earthy, nutty flavor. Quatrain, meaning four lines of a stanza of a poem represents the four grapes that make up this blend. D’Agostino double decanted the wine and told us that the spiciness and juiciness of their best Syrah in the blend pairs impeccably with the bison and local morels’ structure and complexity. 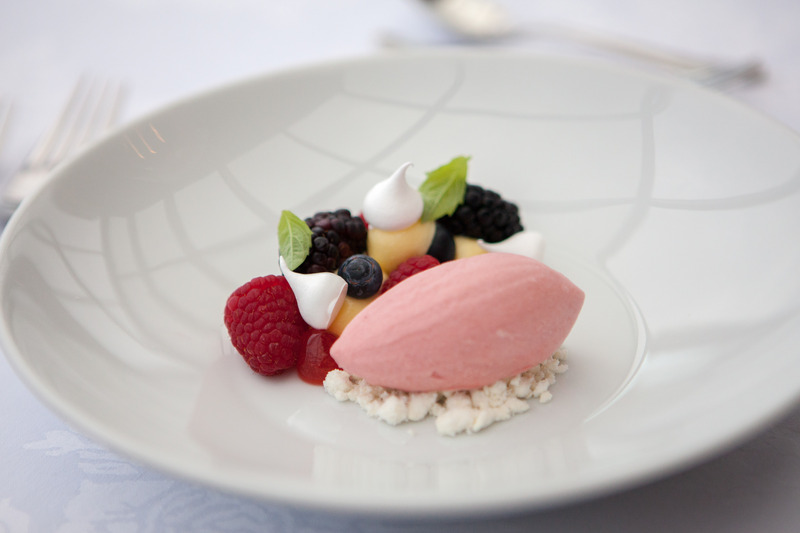 English Elderflower, local berries, berry ice cream, white chocolate with 2015 Mission Hill Reserve Riesling Icewine. Floral flavours are one of the biggest food trends of 2018 thanks to Meghan Markle and Prince Harry who ordered a lemon elderflower cake for their royal wedding. Elderflower bushes are found throughout the UK and apparently, our English guest chef likes to forage for them on his way to work. Carefully packed, his homemade elderflower syrup made it unscathed to Haida Gwaii. It was his most picturesque plate of the night and elegantly light and refreshing. Mission Hill’s Reserve Riesling Icewine was the perfect end to a magnificent meal. D’Agostino told us grapes need to be frozen and then picked at minus 8 degrees C or colder to classify it as “icewine”; so, it’s not a style of wine that Mission Hill can make every year. The Reisling’s high acidity creates a beautiful balance with the ripe and rich flavors of the concentrated icewine. 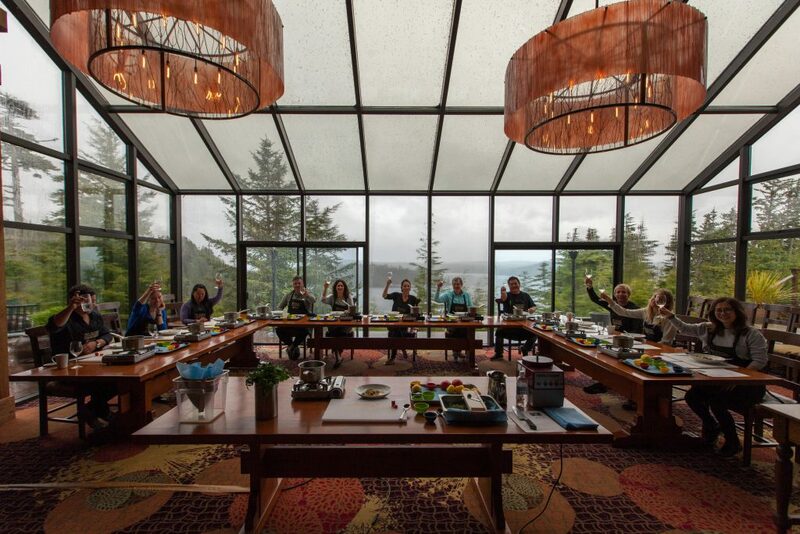 Guests expressed their appreciation that evening through wild applause for our English chef and B.C. sommelier combination. 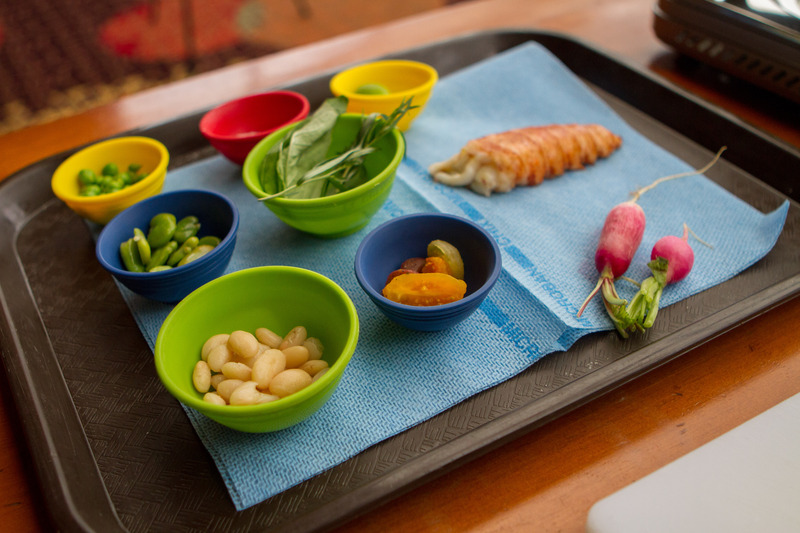 You’d think the culinary performance would be finished after all that work, but not just yet…. A colourful mis en place is set at each participant’s station. 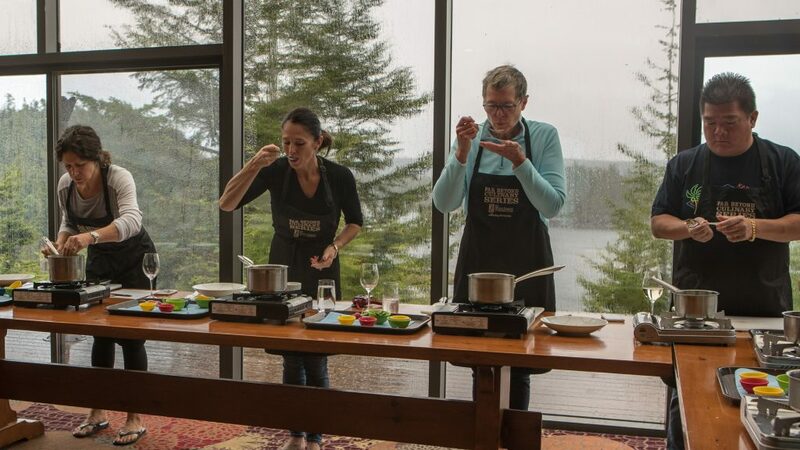 The next morning, Foulkes was up early to lead an intimate interactive culinary demo of one of his favourite recipes – lobster minestrone with white beans, preserved tomato and peas. A comforting dish, minestrone means “big soup” to Italians and is known for the goodies in it, especially beans, vegetables and pasta. Chef Foulkes pours the clear tomato essence which was marinated and strained overnight. The key to Foulkes’ minestrone is the essence which uses ripe plum tomatoes but also the tomato leaves that give off a very strong “fresh tomato” aroma. The tomato essence is not red at all, but a clear broth full of bold flavours. Chef Foulkes encourages the class to continually taste your dish when you cook. Clubhouse guest, Kitt Doucette enjoys one-on-one instruction from Chef Foulkes. Chef Foulkes skillfully plates the lobster to his Michelin-star standards. Et voila! 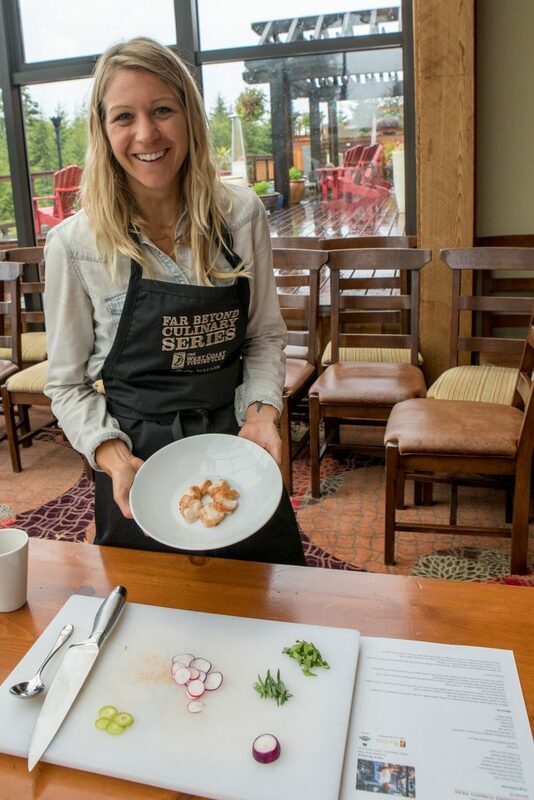 Guest Jackie Costello-Doucette displays her lobster slices carefully placed on the plate. 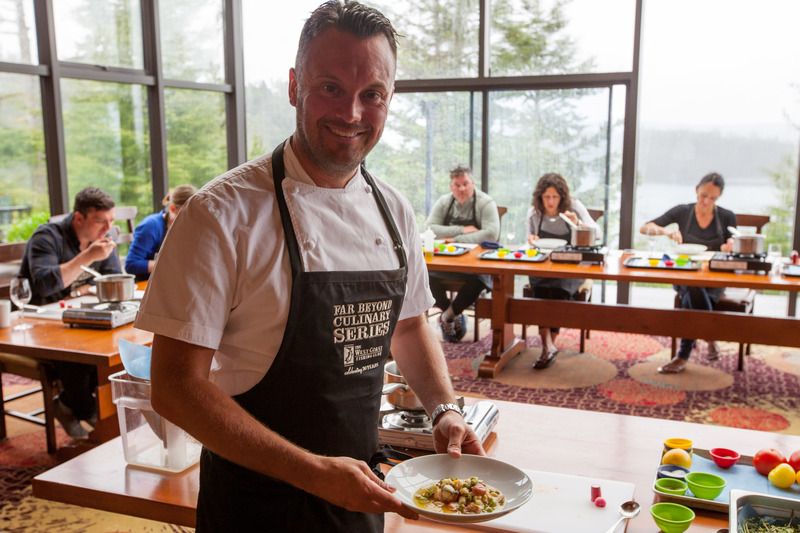 Chef Foulkes presents his finished lobster minestrone soup as our class enjoys the best part of all – eating their culinary creations! Our class happily toasts our host chef! Chef Foulkes’ attention to detail and mastery of perfectly seasoned dishes were a hallmark of the trip. 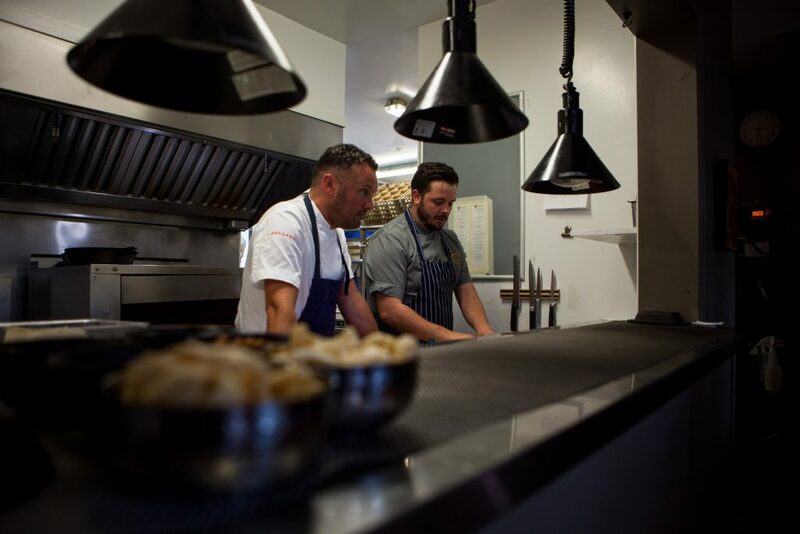 His teamwork with The Clubhouse’s top-notch kitchen team was an impressive sight. 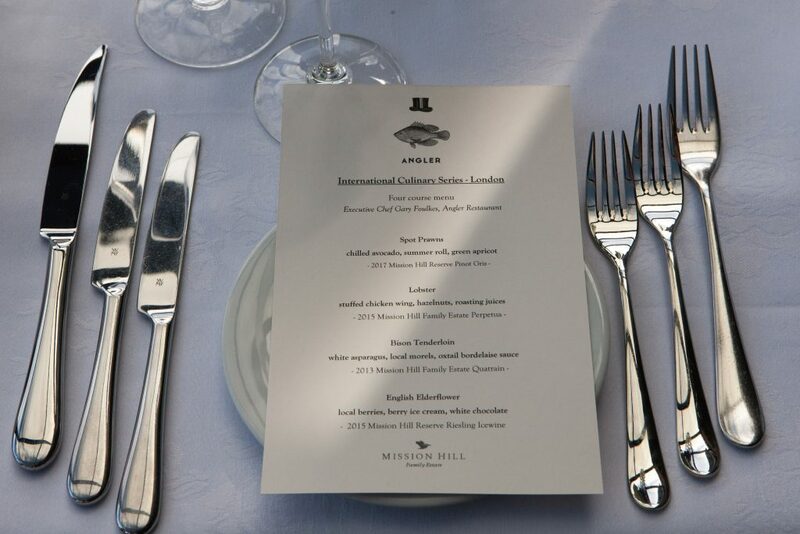 A heartfelt thank you to Chef Gary Foulkes and Mission Hill Winery for making our second annual International Culinary Series trip an extraordinary gastronomic experience. My verdict: a Michelin star is a brilliant addition to the sky over Haida Gwaii. 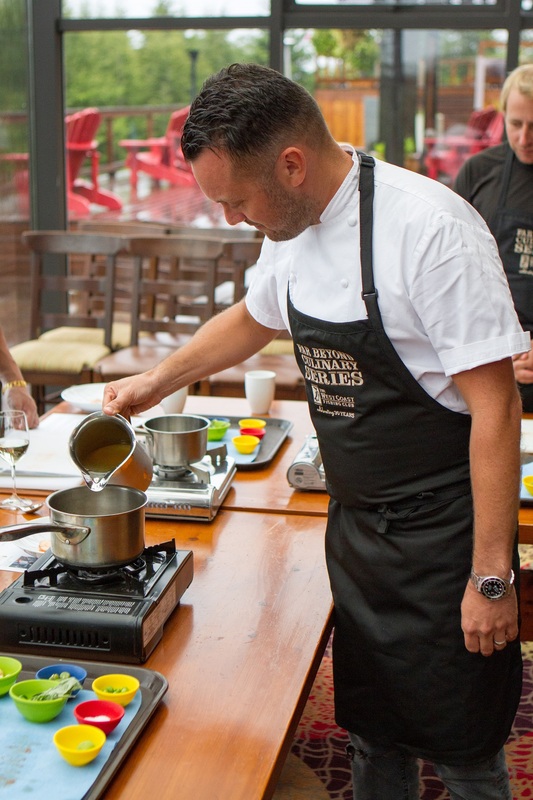 Next year’s International Culinary Series forecast might just have to call for another star. 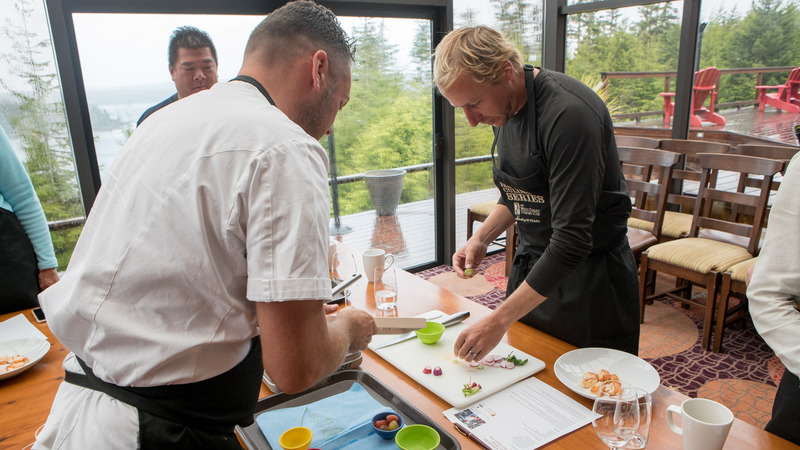 The third annual International Culinary Series at The Clubhouse is scheduled for June 9-13, 2019. Call us at 1-888-432-6666 or click here to make an inquiry online.